With human safety drivers behind the wheel, three of the company's ostentatiously orange Nissan NV200s have been operating in Arlington since October. Drive.ai has reached a crossroads with its self-driving test program. The Silicon Valley startup will conclude testing in the north Dallas suburb of Frisco, Texas, later this week. Company executives say they'll then concentrate their testing efforts in the nearby city of Arlington, where a handful of cars already have been on the road. In part, the changes are due to timing. 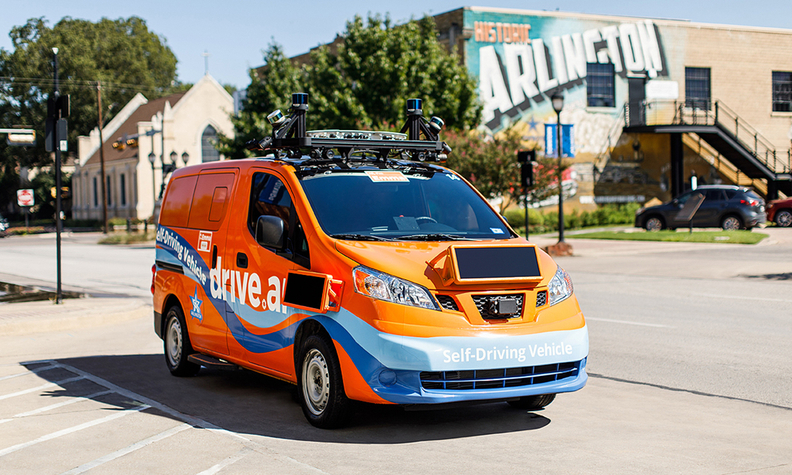 Drive.ai's contract ends at the end of the month in Frisco, where the company has operated self-driving test shuttles on a single route that connected an office park and nearby shopping center. But they also come when the company may be burnishing its credentials for prospective partners or investors. Further, they occur as Drive.ai seeks more complex proving grounds that can push the capability of its self-driving technology and lay the groundwork for a profit-generating business. Arlington fits both requirements, says CEO Bijit Halder. "We've decided to go big on Arlington," he said. "What we have been planning for a long time is to find the right venue to expand our technology and grow our business, and ultimately solve the broader transportation problems that we feel will benefit from our autonomous-vehicle services." With human safety drivers behind the wheel, three of the company's ostentatiously orange Nissan NV200s have been operating in Arlington since October. Four from Frisco will now join the fleet. The combined fleet of seven vehicles will start running on expanded routes that connect the Dallas Cowboys' stadium, an office complex, the city's convention center, Texas Rangers ballpark and now the University of Texas at Arlington. Connecting such a broad set of venues on defined routes might allow the company to attract a wider set of riders — sports fans, visitors, office workers and college students. In terms of a business model, that's more multifaceted than the Frisco testing, which centered upon schlepping officer workers to restaurants at the nearby shopping complex mostly at lunch time. In Frisco, 20 percent of the company's customers used the ride-hailing service more than once a week. Arlington provides the environment to increase that percentage of regular users, while simultaneously introducing itself to a more transient group of users, like fans attending a sporting event. While similar testing deployments have multiplied across the country in recent years, one of the notable aspects of Drive.ai's project in Arlington is that anyone can hail a ride. It's open to the general public. Currently, the service is paid for by the City of Arlington and federal grants, and is slated to run through October 2019 with an option to extend. Eventually, Halder says finding paying customers among its prospective user base will be crucial to the company's long-term success. "I believe our biggest source of revenue should come from users, either through direct fares or monetization in the car," he said. "At the end of the day, self-driving has to solve a transportation problem at a large scale, and in business operations, we want significant revenue. Revenue from the business is definitely important, and a proof point that our product is useful to the user." Economic viability in the self-driving realm, Halder says, won't come until vehicles operate without their human safety drivers aboard. Tentatively, Drive.ai eyes that development at the end of 2021. But he says reaching driverless will be a gradual process, one that includes using remote operators to monitor the Drive.ai fleet and handle complications. At first, he anticipates there will be one teleoperator for each vehicle, and that as the vehicles prove their reliability that will evolve to one teleoperator for three vehicles and so on. The company has a years-long roadmap, and Halder emphasizes it has readied for a "very long haul and a very high resource requirement." To date, the company has raised $77 million, according to Crunchbase records, and reports last month indicated that Drive.ai was for sale. Asked if the company was for sale, Halder said the company is eyeing fundraising and open to new partnerships. "It's possible to have a shallow partnership or a deeper partnership, and we are not dogmatic in saying we have only one way to get to the promised land," he said. "We are flexible. So we are open to all levels of partnerships, depending on our mission alignment. It is not about raising money. It's about being aligned with our long-term vision, and having flexibility on how to get there." For now, all roads run through Arlington.